I’ve been turning something over in my head for a while now: Chamber works are to poems as symphonies are to novels. Hearing a composer’s chamber piece is to see their mind at work, the cogs churning and whirring; experimenting and exalting; wrestling and grappling and fixating on something—namely, an obsession—and turning it over and over again. It’s a something all writers deeply understand. This past Thursday, I heard Steve Reich’s Drumming in its entirety performed at House of Yes (HoY), and it was nothing short of transcendent. 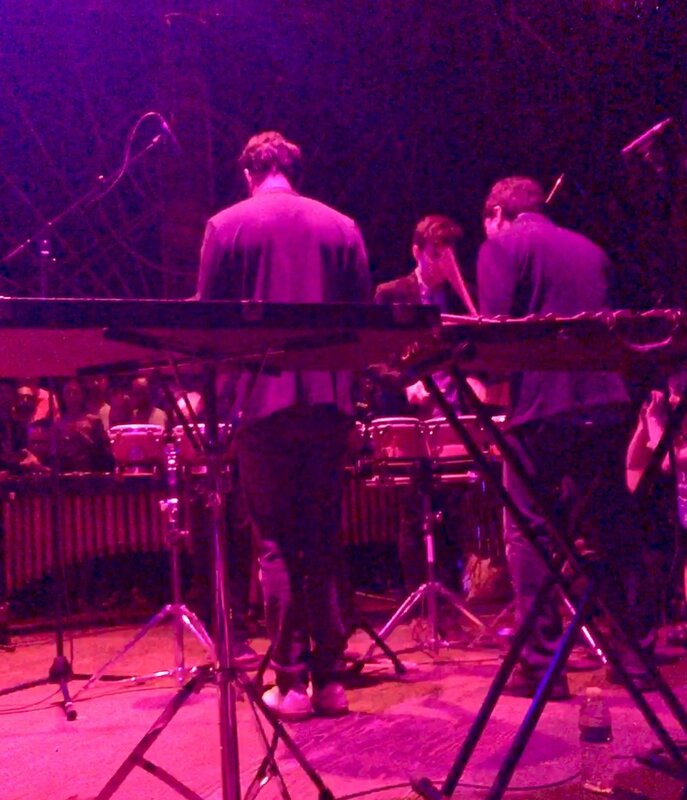 Synesthetic, mesmeric, meditative… Sandbox Percussion along with guest musicians and HoY performers did not disappoint. I won’t lie—I was worried that including aerial performers and dancers and large-scale digital visuals would potentially detract from the music, or distract. But rather it was additive, truly transformative. Reich’s phasing technique is in many ways an aural exploration of obsession. Beginning in unison with a singular pattern, soon one of the performers pushes forward, incrementally faster, displacing the initial line by a beat and weaving a texture of new patterns. The result is a churning state of flux, never stagnant or stale, that is at once soothing as it is surprising. And this isn’t the construction of hierarchies; rather, what becomes is a meditation on what could be if you were to train your mind on one thing—one tone, one motif, one timbre. It’s no wonder I love listening to Reich's music when I write. After the show, I was in this gooey state of awe and raw excitement. Buzzing with presence and visions about what’s to come. All in all, it’s an exciting time, both as active listener and creator. Perhaps sometimes we forgot the intention and deliberation that goes into both these roles. Perhaps we could be kinder on ourselves for even attempting such monumental acts. Just like delving into my full astrological star chart gave me wonderful personal insights and clarity, HD has helped me understand and become aware of my body’s natural tuning. Learning about HD, you hear lots of talk about broadcasting in regards to one's defined centers. Since my Ajna and Throat are defined they are always *broadcasting* to some extent, leaving those undefined/open centers more as windows, through which energy can pass freely and be absorbed/overcompensated/accounted for, etc. etc. I’m a highly emotive person, which is in large part why I’ve always felt compelled to pursue the arts in several capacities. And I’m a skilled communicator, both written and spoken. With a fixed Ajna center—which encompasses that o-so-troubling-but-fascinating aspect of existence which allows us to not only think about but also question the interior of thoughts, the whys and hows and patterns of it all—I also synthesize lots of material, novel or otherwise, fairly routinely and systematically. But both of these fixed parts can cause trouble in my life. I’m working through that trouble, and what better (and predictable, let’s face it) way to do it, but lay it all out here in cathartic ramblings of yesteryear reflections. 2016 was a doozy—at large and on a much more micro, intimate level for me. It was the first year I’ve really been <on my own> not to mention <on the road> and far far away from my Florida hometown for a long stretch of time. I became financially independent in ways I've never been before and learned a slew of things through countless mistakes and a little too much debt on my hands. The learning curve really is steep, but I remind myself that ever step forward ultimately builds endurance. Maybe I grew some callouses last year. Which isn’t to say 2016 was all healing—it also had its share of tears and anxiety and larger existential questioning. Yet I grew and recovered from a very open-sore-sort-of year in 2015. The months immediately post-grad weren’t the kindest nor the happiest, but looking back now I recognize I had to interrogate a lot and break all of it down to move froward: see, (1) ego, (2) ambition, (3) aspirations, and (4) happiness. And then I find a moment to stop, like now, and take a big breath. Fully take in where I’m at now. Starting a new year with a job that speak to my skills and offers an open, creative, warm environment. Working on my craft and thinking more consciously about what all this art-making and feeling these teacherly feels really means. Considering grad school more seriously than ever before. Living in a thriving metropolitan city where I honestly have too much to do, all alongside one hell of a support system and close friends. And here’s another list, because this time of year you just can’t get enough of 'em. This weekend marks my one-month anniversary with New York City. So far I’ve managed to catch the wrong train only a handful of times (and hop the turnstile only once); explore several Manhattan and Brooklyn neighborhoods; snag a job @ the restaurant/bar/venue that apparently launched Regina Spektor’s career (come say heyyyyy! ); and find the best slice of pizza less than a mile away from my apt. I love the energy and pace of this city and I’m grateful to have a space and community that lets me breathe and regroup when it all gets to a boiling point. Speaking of which, super stoked for a genuine autumn season and ready to layer again. I’ve also applied to a couple internships (some paid, others not) and hoping to combine restaurant-serving with creative work.